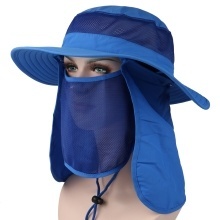 This sun hat with wide brim, removable face mask and neck flap can provide 360° protection when you are camping, fishing, gardening, boating, and more. Made of high-quality nylon material, quick-drying, uv protection and lightweight. Removeable face mask and neck flap offers 360° full coverage and prevent dust and sun burns. 3.1-inch wide brim protects your eyes from harmful sun rays. Breathable mesh fabric on the face mask and crown for good ventilation. Adjustable chin strap helps secure hat in place during windy outings. Free size, fits 56 – 60cm (22.0 – 23.6in) head circumference. Great for fishing, gardening, camping, boating, hiking, and other outdoor activities.